Dubai: The technology to power homes using energy from electric vehicles “is coming very, very soon,” a senior Tesla executive said in Dubai on Tuesday. Vehicle-to-grid is where electric vehicles discharge energy into households or even into utility grids, similar to what is already done around the world with solar panels. But the idea has been seen as economically unfeasible, in part due to the high costs of the batteries used in electric vehicles and the wear that discharging energy would cause them. 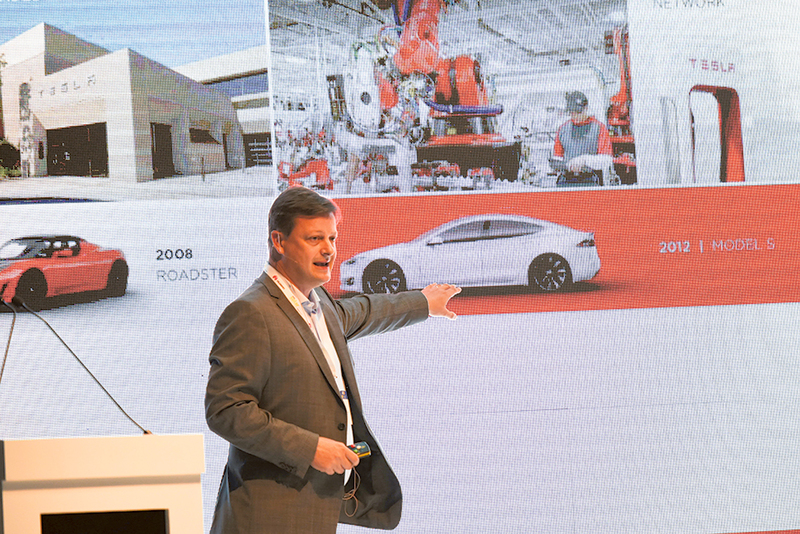 “There is a lot of pilots [programmes] going around the world right now,” Ben Hill, Tesla Energy’s senior vice-president of Europe and Africa, said in a presentation at a conference. Household utility bills could be brought down by vehicle-to-grid. The idea is that an electric vehicle owner would charge their car during off-peak times and then discharge the energy to the house or the utility grid in peak periods when costs are high. Tesla, a pioneer in electric vehicle technology, also makes battery storage systems for households and recently won a major utility contract in the United States. Others are also investing in the technology. Nissan in May announced it was launching the United Kingdom’s first vehicle-to-grid pilot scheme with 100 of its electric car owners using bi-directional charging points to sell energy from their vehicles back into the grid. There is “enormous” potential for vehicle-to-grid, Nissan Europe chairman Paul Wilcox reportedly said at the time. “As we see a decline in the costs of Lithium-ion batteries, which is happening very quickly, Tesla being one of the leaders, what is going to happen is the Lithium-ion battery pack becomes a lot more disposable and the value of charging and discharging in and out of the grid … becomes a lot less,” Sami Khoreibi, chief executive of Abu Dhabi-based solar developer Enviromena, told Gulf News by phone. An electric vehicle with a 30-kilowatt-hour battery stores as much electricity as the average US household consumes in a day, according to a June report from the Rocky Mountain Institute, an energy think tank. “It will be a part of the larger power grid,” Khoreibi said. Growth in the take-up of electric vehicles is also expected to make vehicle-to-grid more viable. Electric vehicle sale are estimated to increase to more than a third of all car sales in the United States by 2040, according to Bloomberg Energy Finance. Today, they account for less than 1 per cent of all vehicles on US roads.